Travels in Holland and Germany. Danish religious fanatic; born in Copenhagen 1644; died there Aug., 1714. Of his early life little is known except that he had studied theology. In 1680 he was a slave-merchant, trading in the West Indies and on the coast of Guinea, in which business he amassed a considerable fortune. In 1694 Paulli suddenly became religious. He proclaimed himself the new Messiah and king of the Jews, announced that he had been chosen by God to convert His people to the Christian faith, and, leaving his wife and six children, set out to propagate his views. He went to France, and thence to Amsterdam, where he began (1697) to publish numerous religious tracts calculated to "rouse Israel from its spiritual lethargy" and to bring about a union between the Jewish and Christian faiths. He maintained that God had especially appointed him for this task because his grandfather had been a Jew and a descendant of the royal house of David. Paulli proclaimed that it was his intention to establish a new Jewish kingdom in Palestine, and he addressed letters to several European rulers apprising them of this resolve and assuring them that Jerusalem would be rebuilt in 1720, in which year the Messiah would descend from heaven to officiate as high priest of the Holy City. He advised the King of France to leave his throne, and to join the British sovereign in assisting him (Paulli) to baptize by force those Jews who would not voluntarily embrace Christianity. On account of these wild and fanatical doings Paulli was imprisoned at Amsterdam in 1701; but in the following year his relatives secured his release on the condition that they would keep him away from Holland. From 1702 to 1706 he traveled in Germany, making propaganda for his cause and continuing the publication of religious pamphlets. His German audiences were, however, less enthusiastic and appreciative than his Dutch ones had been; and in 1706 he returned to Copenhagen. Here a number of Jews assembled in his house and encouraged him to continue his efforts toward the establishment of a new kingdom of Israel. Several meetings were held at which Paulli spoke at great length on his holy mission. But the king, Frederick IV., soon put an end to these demonstrations. He ordered the chief of the Copenhagen police to prevent further meetings, and to admonish Paulli to remain quiet; and thus the anger of the Christian populace, which had been roused to such a pitch that an outbreak against the Jews was feared, was soon allayed. 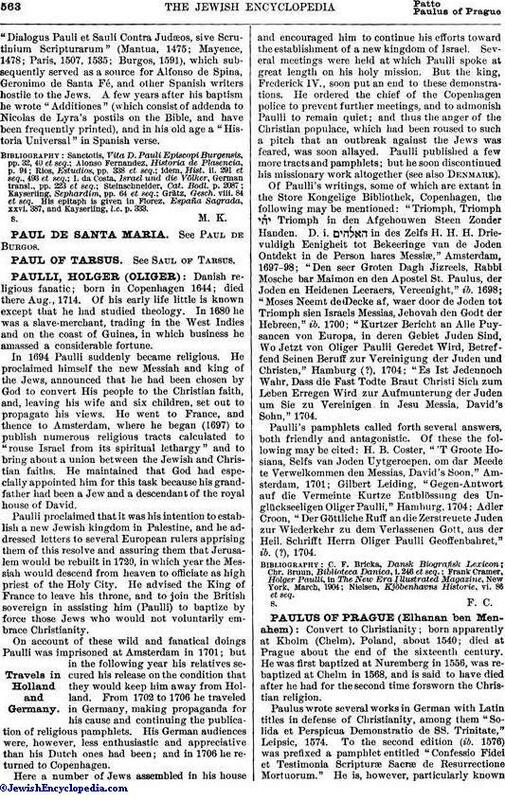 Paulli published a few more tracts and pamphlets; but he soon discontinued his missionary work altogether (see also Denmark). Of Paulli's writings, some of which are extant in the Store Kongelige Bibliothek, Copenhagen, the following may be mentioned: "Triomph, Triomph Triomph in den Afgehouwen Steen Zonder Handen. D. i. in des Zelfs H. H. H. Drievuldigh Eenigheit tot Bekeeringe van de Joden Ontdekt in de Person hares Messiæ," Amsterdam, 1697-98; "Den seer Groten Dagh Jizreels, Rabbi Mosche bar Maimon en den Apostel St. Paulus, der Joden en Heidenen Leeraers, Vereenight," ib. 1698; "Moses Neemt de Decke af, waer door de Joden tot Triomph sien Israels Messias, Jehovah den Godt der Hebreen," ib. 1700; "Kurtzer Bericht an Alle Puysancen von Europa, in deren Gebiet Juden Sind, Wo Jetzt von Oliger Paulli Geredet Wird, Betreffend Seinen Beruff zur Vereinigung der Juden und Christen," Hamburg (? ), 1704; "Es Ist Jedennoch Wahr, Dass die Fast Todte Braut Christi Sich zum Leben Erregen Wird zur Aufmunterung der Juden um Sie zu Vereinigen in Jesu Messia, David's Sohn," 1704. Paulli's pamphlets called forth several answers, both friendly and antagonistic. Of these the following may be cited: H. B. Coster, "'T Groote Hosiana, Selfs van Joden Uytgeroepen, om dar Meede te Verwelkommen den Messias, David's Soon," Amsterdam, 1701; Gilbert Leiding, "Gegen-Antwort auf die Vermeinte Kurtze Entblössung des Unglückseeligen Oliger Paulli," Hamburg, 1704; Adler Croon, "Der Göttliche Ruff an die Zerstreuete Juden zur Wiederkehr zu dem Verlassenen Gott, aus der Heil. Schrifft Herrn Oliger Paulli Geoffenbahret," ib. (? ), 1704. Nielsen, Kjöbenhavns Historie, vi. 86 et seq.